Last year, when working on finishing tracks for the high speed rail connection from Barcelona to France, the construction workers unearthed what was basically a 2,000 year-old wine cellar just north of the city. 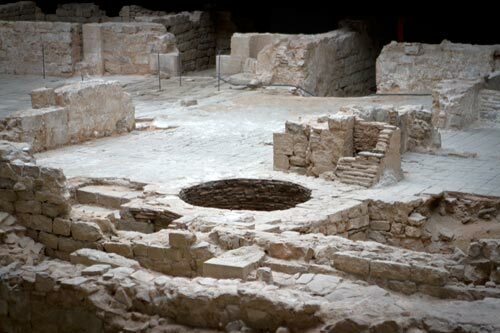 It wasn’t much of a surprise, neither the ruins nor the cellar as it’s well known that wine has been produced–and was really brought to the Iberian Peninsula–by the Romans and the Greeks before them. It started up in Empordà but very quickly spread throughout the region. It’s for reasons such as this that when visiting the City History Museum in Plaça del Rei that, when entering the old, Roman section of the museum you’ll see another wine production cellar. There, the stone are still stained red from the grapes that were pressed and aged centuries upon centuries ago. Soon, with the opening of the Born Market, you’ll be able to see even more of these kinds of ruins. As a neighbor to the area, I was privy to a preview of the space, which is due to open in about six months. The 17th century ruins (and some are much older) that they’ve uncovered contained 50 homes, various wells, a couple of taverns, and that large hole you can see in the photo above. That hole was apparently an old wine cistern. There, someone in this neighborhood made wine (“naturally” I’m assuming) and made it for some time. Was it good? Who knows, but it was wine and that’s all that really mattered. These are but a few examples of the world of wine that lurks but two or three meters below the surface of the Catalan earth. It’s wild, not to mention delicious, to envision.